Rex G. Waterbury, MD, graduated from the University of California in Los Angeles and went on to earn his medical degree from the Bowman Gray School of Medicine at Wake Forest University. He completed his residency at the Medical College of Virginia and is now a Fellow of the American College of Obstetrics and Gynecology. Dr. Waterbury offers comprehensive gynecologic care to women throughout the region. His patients know they can rely on his expertise to prevent and treat women’s health problems, and they appreciate the type of personalized care he provides. 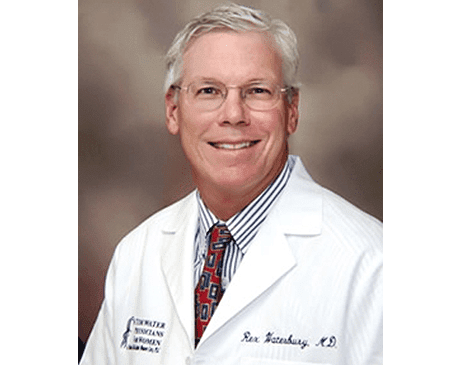 When he’s not practicing medicine, Dr. Waterbury continues to serve as a member of the clinical faculty at Eastern Virginia Medical School. Dr. Waterbury is married and the proud father of two sons. In his free time, he loves to travel and compete in marathons and triathlons.